Anthony Doerr’s Pulitzer prize winning All the Light we Cannot See is a niftily crafted WWII tale which is an exuberant celebration of innocence amidst the ravages of war while simultaneously managing the excoriation of a corrupt civilization that makes killers out of children. It is not without niggling flaws that include occasionally overblown prose and an indulgent pace but the characters are so engaging and the story itself is so enthralling that all will be forgiven by the time the reader devours the last sentence. The plot follows the lives of a blind French girl, Marie – Laure and an orphaned German boy, Werner, with a gift for science and an uncanny understanding of the intricate workings of radios, against a timeline set before, during and after the German occupation of France. The former is forced to flee Paris with her father, a locksmith and keeper of keys at the Museum D’Histoire Naturelle to his Uncle Etienne’s home in Saint Malo. He is in possession of the fabled Sea of Flames, a rare diamond with a bloody history which has been in the museum for 200 years. A Sergeant Major of the third Reich is hot on their heels in pursuit of the diamond which supposedly carries a curse. Werner’s talent for fixing things gets him noticed and he is packed off to a National School to learn how best he may serve the war effort. All too soon, his brilliance is employed in tracking radio transmissions across Russia and Central Europe, while fellow soldiers rack up an appalling body count. Eventually, the war takes him to Saint Malo and the blind girl with whom he had forged a magical connection, long before either was aware of it, in the forlorn hope that he might somehow recapture the best part of him that had been leached out by forces beyond his control. The rich material has been assembled with great care into crisp, concise chapters designed to hold the attention of the reader. Doerr zigzags his way through various points in the narrative building suspense in parts and killing it in others with both approaches achieving similar degrees of gut – wrenching potency. His careful exploration of the factors that led to ordinary German citizens becoming the instruments of so much horror is without judgement and thereby, effective. Doerr’s balances with consummate skill on the knife edge as he portrays the angels and demons that war seems to churn out. For every kind old lady who opens the door of her heart and larder to the needy and making sure she does her part to aid the resistance there is a blackguard who will sell his soul and rat out innocent neighbours in order to curry favour with the oppressors. Portions involving the schooling of Nazi youth, who are brutally honed into unthinking and ruthless killing machines to be used in service of the fatherland, constitutes a powerful portion of this tale. Is there anything else that can be said this remarkable book? It made me care deeply about some of the characters, one in particular. I prayed for them all to make it through the bombing of Saint – Malo as well as the malign forces aligned against them and wept unashamedly when my favourite did not survive. Doerr’s devastating portrayal of what the war did to dreamers is heartbreaking in the extreme but also a towering testament to all that is good in human nature which will always carry the promise of redemption. PREPARE TO BE ENCHANTED THIS OCTOBER by SHAKTI: THE DIVINE FEMININE! 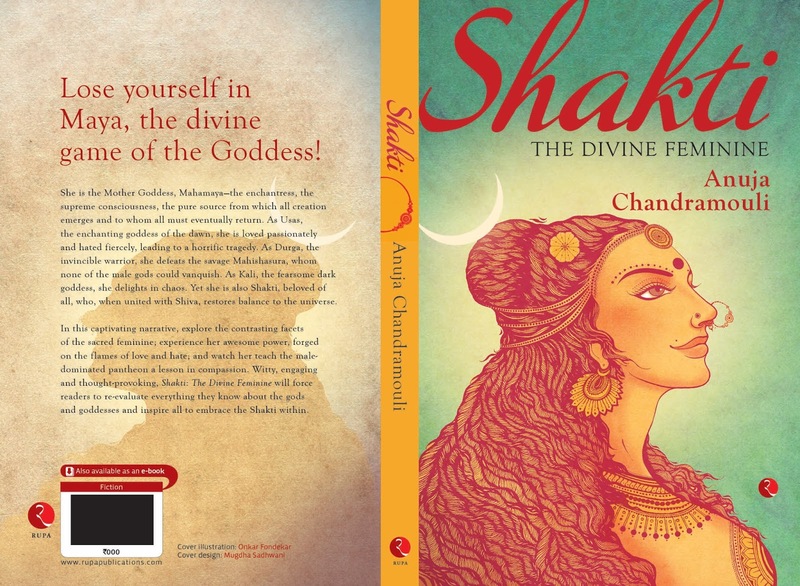 Absolutely delighted to announce that my third book, Shakti: The Divine Feminine will be hitting the stands this October. It is a book that is very close to my heart and unlike anything I have attempted before. Can't wait for you guys to read and give me your feedbacks. Keep watching this space for more details!